Oh I love ModCloth! I just bought the cutest Christmas presents this weekend! My honey also bought me an adorable necklace from Modcloth named: "Sew Charming Necklace", perfect for a girl who loves DIY projects and Vintage! (See Feel Bohemian collage, necklace #2), I just adore it! Modcloth has a lot of wonderful things; I always love shopping there. I also adore their accessories and jewelry, especially the necklaces because they're so artistic and unique. The shoes are just lovely too! If you already know Modcloth, then you know what I'm talking about. If you're a Vintage lover, they also carry a great selection of vintage pieces. Yesterday, I got very inspired by the Modcloth and decided to create three looks appropriate for any party or event you have this Holiday. I find their dresses very beautiful and flattering for any type of body. Oh before I forget, Modcloth is having Free Shipping on orders over $75.00 Yay! Hope you like these looks! Happy Holidays!!! Oh me encanta Modcloth! Este fin de semana hice unas compritas para regalar por Navidad. Mi chico también me regalo un lindísimo collar de Modcloth llamado: "Sew Charming Necklace", este collar es perfecto para una chica que adora los proyectos DIY y lo vintage (ver el collar #2 del 1er collage)! Modcloth tiene cosas maravillosas; me encanta comprar siempre ahí. También adoro los accesorios y joyas que tienen, especialmente los collares porque son muy artísticos y únicos. Los zapatos me encantan también! Estoy segura que si ya conocen Modcloth, deben saber a lo que me refiero. Si te encanta lo Vintage, también tienen una selección genial de todo tipo de piezas. Ayer mientras visitaba la pagina de Modcloth, quede inspirada y decidí armar tres looks apropiados para cualquier fiesta o reunión en estas fechas festivas. Pienso que sus vestidos son muy lindos y además van perfecto con todos los tipos de cuerpo. Oh antes que se me olvide, Modcloth esta ofreciendo envío gratuito en pedidos de $75 dólares o mas! Espero que les guste estos looks! Felices Fiestas! Love those boho looks... and how sweet to be gifted with a necklace which is meant for you. I so agree! 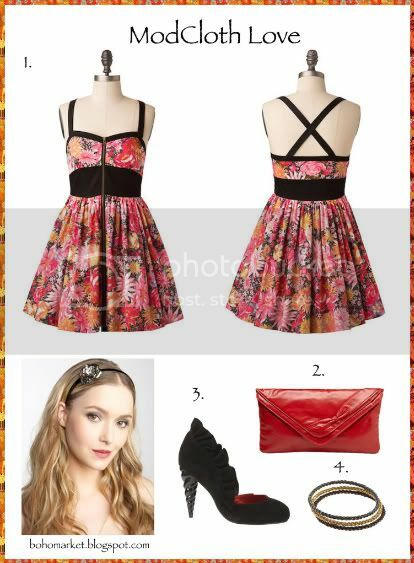 I love modcloth, they have such gorgeous vintage inspired dresses, love the second look! I love the first collage best~hat dress and necklace are beautiful!! You are one lucky lady!! Oh I think Modcloth has the most sweetest and cutest things!! Their dresses are absolutely lovely!! Gorgeous picks!! You have the best taste. :) I'm in love with those brown boots and that last dress!! I find myself going to modcloth atleast once a week to peek & drool!! The first look is adorable! I send you an email! Waiting for your answer! Oh, Merry Christmas and an amzing New Year! I just sent the email again! that's funny i never find anything i like when i look on modcloth but i love what you picked! especially the Betsey Johnson dress! do you know the web site asos.com ? Thanks for featuring ModCloth on your blog! We appreciate the support!! What would I do without you Giovanna? Love Modcloth! I heart all their dresses, the quality is fabulous as well as the designs!! I adore the first look you create! Modcloth rocks my world. I think I NEED that LBD!!! Mil gracias a todas por sus lindos comentarios! Giovannita no conocía esta marca pero ahora gracias a ti veo que tiene unas prendas hermosas, muy casuales pero con clase. oh me too! the clothes are just so gorgeous over there! p.s. love your music I've got a lot of the same tunes on my playlist!!! Everything is so cute! I have not shopped at ModCloth yet, but I must go see the rest of their things now! These outfits are gorgeous.. I love the way you add your personal style on each collage. I think I found my place for shopping! You're right about the necklaces, they're absolutely adorable. Me encantaron los collages! Me desespera un poco no poder comprar por internet desde acá. Y gracias por los saludos de cumpleaños! I love Modcloth. I can't really wear their clothing, but I love their accessories. Very unusual and fun. Que blog más chulo tienes! Gracias por tu comment! I love the looks! The second one is my favourite, and I love the sewing necklace from the first one! I just found your blog and I'm glad I did! Thanks Giovanna for your nice comment, I really would like to exchange links! I add your blog on my blog list! Me encantaron las prendas y los accesorios de tus collages!!! I'ma huge mod cloth fan! I love the boho looks you put together! qué lindo el primer look. el dije no lo pude apreciar bien...es una maquinita de coser? Que sea ésta Navidad llena de hermosas cosas para ti y éste año Nuevo te llegue lleno de mucho éxito, mucha paz y mucho amor! Los mejores deseos para ti y tus seres queridos! Me gustan los looks 2 y 3!!!! el LBD esta muy bonito y me encanta que tenga detalles en fuscia!!!! Aqui no hay Modcloth :( hacen shipping internacional??? Precioso, muy de tu estilo ¿verdad? Una mezcla entre bohemio, romántico y chic. Wonderful post -- why don't you have a "print this" button? I saved these images because I'm going straight to Modcloth to buy them :) Thanks for sharing dear you have an exquisite taste.